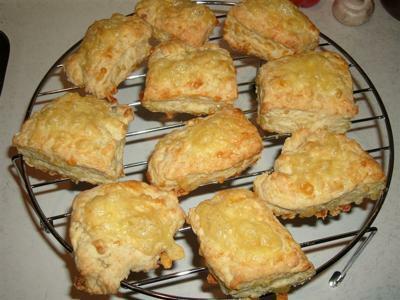 Here is a unique and yummy recipe for cheesy curry scones! Preheat oven to 220C (425F) degrees. Sieve flour, curry powder and baking powder together. Rub in butter (should look like fine breadcrumbs). Stir in yogurt and a dash of milk, and mix (should be soft but not sticky). Put on floured board, roll out to 3/4 inch thick. Cut into rounds and place on greased tray. Brush with egg and sprinkle grated cheese. Note: If you don't like curry you can add mustard powder instead. It would be a yummy treat for the kids they when come home from school. this looks yum! i've got to try it!